Another important patch: pieces of equipment now have a statistic requirement, so they can’t be equipped if you don’t meet this requirement. This doesn’t mean that a Magician with low strength can’t wear any heavy armor. You can mitigate this with our new Skill system. We’re introducing 12 Skills for your character that can be improved with Skill points! 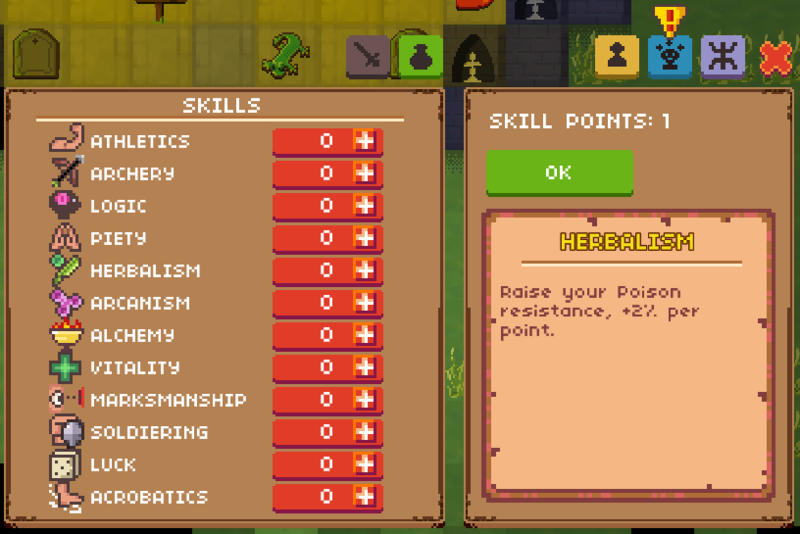 You hero will now gain 1 new skill point per level, that you can choose to spend on one of those Skills. These skills can lower a specific statistic requirement, or raise your resistances, or even raise your combat abilities. Pieces of equipment now have a statistic requirement on STR, DEX, INT or WIS.
New Skill system, with 1 points per level to distribute. The 12 skills are: Athletics / Archery / Logic / Piety / Herbalism / Arcanism / Alchemy / Vitality / Marksmanship / Soldiering / Luck / Acrobatics. Added a new tab for the Skill system. Icon alert when a new Skill point is available to distribute. Monsters can’t be hit when placed on a trap or a zone effect. Rooms too close to the map limit, without enclosing walls. Many typos on the vendor and buff descriptions. YES button difficult to trigger on the Vendor screen. Vendor refusing to buy some unidentified items. Thanks all for your interest, happy gaming and thanks for your support! Paper Dungeons Crawler [0.11] Stores, Game Balance. This Version will stay on the Beta branch for 2 days and then will be replacing the default branch if no breaking bugs are found. Shades now appear on the bottom of the dungeon walls. In the inventory, focus stays on your selected item, even when you move it around. Stores are now implemented to sell your items or buy new equipment. They are found on the 4th floor of each dungeon. Monsters now have less chances to drop equipments, but they have a higher chance to drop gold. The maximum damage absorbed by your armor is now 90% vs Physical and 50% vs Magical. The maximum damage of 60 hit points is now only applied to monsters. The player’s damages are no longer limited to a maximum. You player will now automaticaly get out of fight if he is not in combat for more than 6 turns. Your WISDOM and INTELLIGENCE bonuses now impact the base speed of appraising. VETERAN MODE: This mode now only allows Normal or Tough difficulty. Monsters spawning on top of solid items, like doors and tombstones. Trees’ sprites on zone 2, 3 and 4 appearing under the player and items. Faery health & mana healing not appearing on the player statistics. Items bumped repeatedly by the player like the paid chest staying out of position. On PC, the game now supports DirectX9 and Windows XP. So it should be more compatible with older systems and graphic cards. PreviousPaper Dungeons Crawler now on Early Access!